#84 Dylan Ferguson and #10 Jake Derifield played in an All Star football game last weekend. 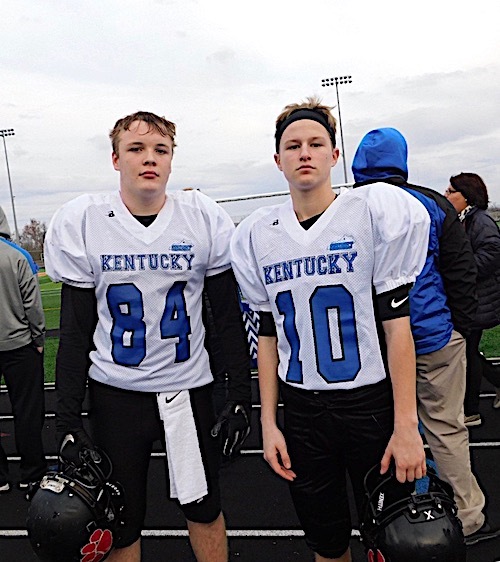 LEXINGTON, KY. — A pair of Louisa middle 8th grade football players participated in the East vs West Kentucky State Middle School Association State All Star Classic this past Sunday at Frederick Douglass High School. Dylan Ferguson and Jake Derifield played for the White team and came away with the victory, 19-14 after being drafted by the coaches before the game. Ferguson played defense and played well with several tackles for loss and also had an interception that he almost returned for a touchdown. He also had a nice return on a kickoff. Derifield played offense as a wide receiver and even though he didn’t catch a pass, he blocked very well downfield. Neither team threw the ball much.